@marie67 lol, someone is a little obsessed with when their first kiss is gonna happen. Personally, I don't think it will happen till we get past episode 20, but you never know with this show. In case no one knows, I am totally in awe of Joowon. I won't say I am a Kdrama veteran but I have seen a fair share of kdramas. Korea I dare say, has the most number of handsome, good looking actors and quite a few can seriously act. Even the mediocre ones will pass with flying colors compared to their peers in Asia(not including China as I have yet to watch drama serials from mainland China except movies). If Joowon just banks on his good looks, he will be a dime in a dozen in k-entertainment industry. But this guy is blowing viewers away with awesome acting skills and dedication to his art. He has gone from strength to strength in just 3 dramas. In Baker King, although he was the antagonist, I found myself drawn in so much by him than Yoon Shi Yoon. He played a totally detestable character but yet in a few precious scenes where he displayed his vulnerability, he bought me over so good that I was rooting for him rather than Kim Tak Gu. His acting there was not completely great but hey, it's his first drama and boy, he nailed it superbly in all the emotional scenes. That was a sign of more greatness to come. Thank God for whoever casted him as Hwang Taehee in Ojakgyo Brothers. After seeing him as Ma Jun in Baker King, no one would have imagine Joowon playing a character like Taehee to such perfection. It's a 180 degrees change from one character to another. 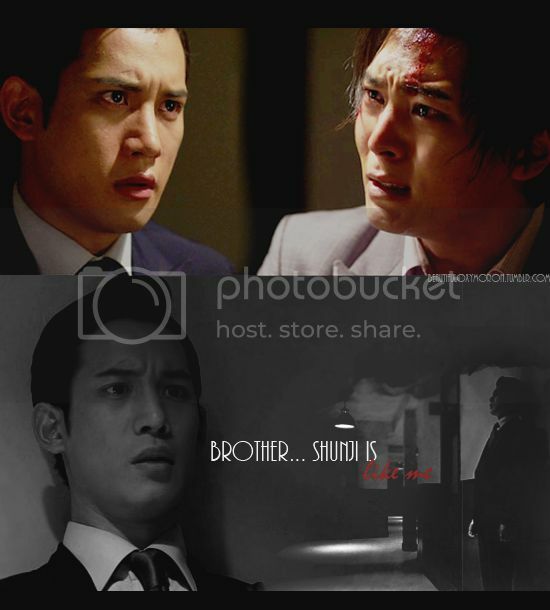 When I look back at Ojakgyo Brothers, I realised that Taehee is a man of very few words. The abandonment and trauma he experienced as a child led him to become a man who is outwardly a perfect and obedient son whom the entire family can rely on but on the inside, he is crippled emotionally. He lived his whole life suppressing his true feelings and emotions until he met his true love. With a character as such, not speaking a lot and keeping all his emotions inside, Joowon could emote all his feelings just through his eyes, tone of voice and body gestures. And when he falls in love with Jaeun, their chemistry is so so out of this world that viewers were all shipping them like crazy and crying out that they are a Real Couple. I am one of those. I never ship any couple before or after. Even when I ship Mok Dan and Kangto, it's only in reel life. For Joowon and Uee, they played a couple in love so convincingly that it's hard to think all those feelings they emote are for screen only. Then of course, now we have Joowon as Lee Kangto in Bridal Mask. Another 180 degrees change from the sweet Taehee to angsty, badass Kangto. I have said before that Joowon completely owns this role. The first 6 episodes totally blew me away although I already expected nothing short of greatness from this guy. Those epics scenes will go inside my treasure box for good. And from episode 7 to now, I am awed again. Joowon has managed to turn Lee Kangto the villainous creature to a hero worthy to be admired. I loved the way he stood up and fought for the Joseon folks in episode 15, he is no longer just donning on the mask to revenge his family, he genuinely feels for his people and fight for them. And thank goodness, he has not lost his cunningness and smarts when he played such a great psychological game with Shunji in the latest ep. The last I want is a brave but slow thinking hero. Now, we can see a bit of that smooth talking, street smart Kangto of old when he was verbally sparring with Shunji and the rising Joseon son in the new Kangto whenever he looks at Damsari or fighting for the common folks. There has been quite a number of BTS of late, showing the other side of Joowon, goofing around on the set. If you watch 1N2D, you'll realise this is one funny, aegyo loving, young man who is always smiling. What amazes me is that he can be cheery and goofy in one instant, then totally serious the next. Just look at that running BTS in ep 15. In the actual clip, he looked so cool and darn hot when he was running after Mok Dan. In the BTS, it's the funny Joowon all over once he reaches CUT. This guy keeps surprising me with his abilities. If you have not watch him winning the crying game in 1N2D, you should. The video link below, if you are interested. I expected him to win, actually. But what I did not expect, was the conditions under which he achieved it. the task was for all of them to shed tears within a given time. I had thought actor like veteran Uhm Tae Woong, Kim Seung Woo and Chae Tae Hyun would have no problem. But no one expected Jong Min to make it so difficult with his hilarious facial contortions. Even those veterans couldn't deliver under that circumstance. And mind you, Joowon was seated just next to Jong Min. I take my hat off to his awesome concentration. Now I know how he can be that guy offscreen and then, just like the way he magically changes into his Gaksital costume, he turns on his full charisma when he is in character. How not to love such a guy? @mrdimples: That crying game was AWESOME! You could really see him switching on his acting mode, and he cried in less than a minute! All his hyungs were so impressed. I hope he back "old Shunji"
i don't care if it's one ep per week. i'll take one over zero any day. ha. need at least one. please. PLEASE! Remember! if you're going to take out and put it on tumblr... REBLOG! it's in the gaksital tag! Never repost! You know I just worked myself up over a particular comment on Dramabeans that I literally feel my blood pressure shooting up. Thank goodness I don't see this person lurking here. It takes effort to analyse her comments because she never comes cleans with what her true feelings are about this show. And she hides it so well that you get people finding her comment disputable but yet has to agree with her on some points. And I don't mean the simple "there is some things i like about this show and some things i don't" I hope I am wrong but she seems to have a remarkable disdain for Korea and it's so thickly veiled, you really got to read between the lines. I just wish I could express myself better and shoot her down point for point. maybe i am taking things too seriously as after all in cyberworld, things like these are to be expected. IDK but when I really dislike a certain drama or genre, I just dont watch it, why spend so much time dissing it in that drama's forum? I only want to spend time gushing on what I love and be upfront about it. I loved MD in this episode. She gave me goosebumps when she stood up to konno and I liked that the 2nd gen. Japanese were questioning the pro Japanese stance as well. Man this drama...It's been a while since I've been so captivated by a drama throughout most of its run. Seeing how Korean dramas go....by adding more drama...I'm hoping that the next episode doesn't pick up with Damsari getting killed with all his other comrades to protect Kang-to with his dying words to Kang-to, asking him to take care of Mok Dan. Then it goes on for a few episodes of Mok Dan hating Kang-to even more for "breaking" the confusing promise he made at the end of the episode to help her father escape. This whole misunderstanding and Damsari's death strengthen Kang-to's resolve to fight for the independence while protecting Mok Dan. Just a conjecture...but I think it's entirely possible. In this latest episode, finally the truth that the 2 guys love the same girl came out. Suddenly, I have this image of Mok Dan with her back bared in the closet, only this time, it's Kangto who is hiding her from Shunji. Gosh, that will surely end up with one of the guys dead.